I just finished reading an article from Psychology Today and I think the information needs to be shared. 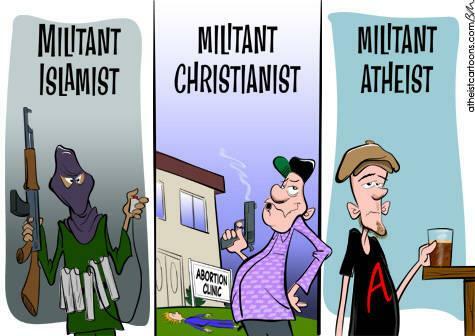 The media spins this narrative that atheists are “militant”, but people need to understand that religious people are the ones committing all the violence, not atheists. Nine bullets fired from close range ended the life of Salman Taseer last month, making the Pakistani governor the latest high-profile victim of religious violence. Taseer had the audacity to publicly question Pakistan’s blasphemy laws, and for this transgression he paid with his life. Taseer joins a list of numerous other high-profile victims of militant religion, such as Dr. George Tiller, the Kansas abortion doctor killed by a devout Christian assassin in 2009, and Theo Van Gogh, the Dutch filmmaker whose provocative movie about Islam resulted in his being brutally murdered in 2004. With this background, it is especially puzzling that the American media and public still perpetuate the cliché of so-called “militant atheism.” We hear the disparaging term “militant atheist” used frequently, the unquestioned assumption being that militant atheists are of course roaming the streets of America. In fact, however, while millions of atheists are indeed walking our streets, it would be difficult to find even one who could accurately be described as militant. In all of American history, it is doubtful that any person has ever been killed in the name of atheism. In fact, it would be difficult to find evidence that any American has ever even been harmed in the name of atheism. It just does not happen, because the notion of “militant atheism” is entirely fantasy. Most atheists advocate critical thinking and that a person can never be certain of anything. This leads them to be skeptical about any claim and demand the same sort of evidence that a court trial would require. Very few people would die or inflict violence for something they’re not fully convinced of. Religious people aren’t that way. They’re driven by internal convictions and lift blind faith up as the highest virtue. This leads them to feel their personal subjective feelings and prejudices are really messages from God, and they have a divine mission to bring about some holy order. They believe that if this holy mission isn’t fulfilled, billions of souls will be lost to burn in hell for all eternity. It tells them the whole world is in decline, ruled by the devil, and they’ve been infused with the holy spirit to cleanse a fallen world before it ultimately destroys itself in Armageddon. As the Bible says, “What can a man give in exchange for his soul?” Religious extremists are those who really believe what’s written in the holy books and they act accordingly. I’ve noticed that religion can be spun into anything. I live here in the United States where roughly 80% of people are Christians of some sort. I’ll only speak briefly about what I’ve noticed with religious people. If a person has a gentle and kind disposition, they tend to cherry pick the “love” verses from the Bible and live a good life. They’ll talk about Jesus, how he loves them and others unconditionally, and how God gives them strength. They’ll tell you how God gave their life meaning, a hope that they’ll be reunited with their loved ones, and that God is love. They’re not forceful and if you don’t agree with them, they give you a compassionate look, sometimes giving off an aura that they feel sorry for you, and they’ll tell you that they’ll be praying for you. After this encounter they’ll hand you some sort of tract with Bible scriptures on it. When you confront them with some of the stranger things written in the Bible, they say it was for an earlier time, or they’ll simply ignore it and act like it doesn’t exist. Most all religious people you meet are like this. Their faith is something that makes them feel better about themselves and the world, and brings them peace about their future death. But religion has some nasty side effects, and in a small minority of believers, it will serve to amplify, while also lending an ardent infallibility to, their personal bigotry, prejudices, and xenophobia. If they have a hateful disposition, they’ll scour through the Old Testament and find verses which condemn gays, or they’ll try to control their wives with scriptures like, “Women should be silent” and “The man is the head the household.” They’ll look at the rest of the religious world, even those of the same faith as themselves, and say that they’ve forgotten their roots! The church has backslidden! No more of that touchy-feel-good crap, people need a message of hell fire and brimstone! Have they forgotten about the ultimate fate of unbelievers? Don’t they remember that their purpose on Earth is to convert the world to the Christian faith? They’re completely intolerant to any other belief system. From those I’ve encountered, they believe that anyone who doesn’t share their beliefs is in some sense possessed by devils. They’re always under “attack” from the devil, and have a persecution complex. They’re difficult to live with in a democratic society. Any time they fail to get their way, they feel it’s a form of social moral decay. Like their much kinder counterparts, they’ll also say God is love, but they have a different spin on things. Love can mean anything, and these people tend to think in terms of hard love. Their mission is to clean up. Their fervent passion and inerrant convictions make them the most likely candidates of religious extremism. It doesn’t help that many of them believe the end of the world is near, and that the anti-christ could show up at any moment. Religion is complicated, but people need to realize these nasty side effects. It’s often believed that religion brings kindness to the world and that without it we’d all be lost. If you read history and study human psychology, you’ll clearly see the that our problems are much more complicated. And really we’ve only just scratched the surface of the problems with religion.